It’s true. Cafe writing is a cliche. Some writers romanticize the laptop and steaming latte. But it’s a cliche for a reason. Stuck writing at home? Here’s how to get rid of annoying neighbors and get back to writing. The doors are always open. The temperature is set. And you can even meet clients or take calls here. Yes, there’s no better place to work away from home than your local cafe. And in Bakersfield, that cafe is Dagny’s. You’ll want to pull up a chair and hang out here. Which is important in a place you’ll spend hours writing in. Even the bathroom situation at Dagny’s is almost charming. Almost. Dagny’s Coffee Company is the quintessential small-town cafe. So if you don’t live in Bakersfield, you can get a similar experience at a locally-owned coffee shop in your city. Dagny’s offers all the basic comforts for the work-away-from-home crowd: climate control, good lighting, refreshments, a stocked restroom, and a manageable noise level. One of Dagny’s best features is their floor-to-ceiling windows. They wrap the building from 20th to Eye Street. That means good natural light during daytime hours. The lighting is fine in the evening too when the backroom’s fluorescent fixtures offer plenty to work by. But the front room’s spot and track lighting make for a cozier vibe. You’ll find all the expected cafe sounds. Espresso machine whir. Milk steamer hiss. Cash register, conversation, laughter. It merges into that ideal cafe hubbub that enhances a writer’s focus and creativity. Wander into Dagny’s any night of the week and you may find yourself in the midst of a poetry jam or live Irish music performance. There is plenty of inspiration here. Snippets of political conversations rise over the din. A lover’s quarrel from the sofa. Business men sip lattes, their suit jackets draped over mismatched chair backs. A girl in black lipstick and combat boots reads Harry Potter in an arm chair. People work on laptops at the window bistros. Even the cafe tables outside are full of smokers huddled in scarves. First Fridays downtown are particularly busy. The crowd overflows and forms standing groups on the open concrete around 7:30, so get here before 7:00 if you want a table. It’s the perfect time if you’re looking for character inspiration. And if people-watching is your thing, the window bistro tables are for you. They’re recessed from the crowd, so your laptop will be safe from bumps and spills while you take notes. But you’ll still have a great view of the crowd. Prefer to focus on writing? Show up during daylight hours when Dagny’s has that laid back cafe feel. The crowd is thinner, and it’s easier to score your choice of table. The decor offers little to pine for. You won’t find Starbucks’ attention to detail, unified design, or consistently high-quality coffee. But what Dagny’s lacks in upmarket precision, it makes up for in comfort and ease. Dagny’s central location means it’s easy to find and quick to get to. Great for a reliable work space. Don’t let Dagny’s downtown location spook you. Bakersfield has put a lot into beautifying its downtown district. And it shows. Even better, Dagny’s is in the heart of what is now the Bakersfield Arts District. It’s clean. And the nearby boutique shops, thrift stores, and art exhibits offer plenty to see when you’re ready for a break. Parking can be an issue during lunch hours. So find a spot out front before or after the 11:30-1:30 lunch rush. Can’t find parking? Try the parking structure on 18th & Eye. It’s just two short blocks from Dagny’s. There’s a variety of seating. You’ll find bistro and dining tables, work bars, sofas, and stuffed chairs. And that’s just indoors. Iron tables wrap the building outdoors on two sides. Since it’s a coffee shop, it’s easy to meet clients at Dagny’s if you’re a freelancer. They’re receptive to long-term sitting and working. And you could probably take work calls here too if you get an isolated table or take the call at one of the tables outside. Lunch options are good near Dagny’s. You’ll find three restaurants within walking distance. Chef’s Choice Noodle Bar offers inexpensive Asian fusion. The Mark offers heartier fare, like steak and salmon. The Padre is a little further away at 18th & H. All three restaurant offer gluten-free dishes. Try a Hemingway writing day: oysters at The Mark, espresso and writing at Dagny’s, then cocktails at The Padre’s Brimstone bar. Wifi at Dagny’s is available and free, but it isn’t fast. That could be a good thing for writers. I found the slower internet kept me focused on writing because checking my social media accounts was more trouble than it was worth. But the WiFi was more than adequate when I needed to check the online thesaurus. Access to power outlets is one of Dagny’s best features. Few places offer this many charging stations for your laptop or phone. There are a few power outlets in the front room. And when those are full, the backroom offers a couple dozen more at the work bars alone. The bathroom situation at Dagny’s is a bit of a problem. This cafe gets pretty busy at times, and the single toilet can’t always keep up with the crowd. Don’t wait if you need to go. A line for the restroom forms fast and moves slow. Master the squat before you use this toilet. In fact, using this bathroom at all could qualify as an Olympic sport between the squat and the one-legged-balance/turn-your-face-to-flush combo. And no way you’re walking away from that hand-washing situation without getting wet. That faucet moonlights as a fire hydrant. It could put out fires from two blocks away. The up side? A few hooks hang on the wall to keep your gear off the ground. And if you have your laptop with you (don’t leave it unattended at a table), you can always wipe down the sink and make a bed of paper towels before you balance it there. The more I write at Dagny’s, the better I get at managing the bathrooms situation. Maybe you will too. And even if you don’t, you can’t beat Dagny’s for a great place to write in Bakersfield. 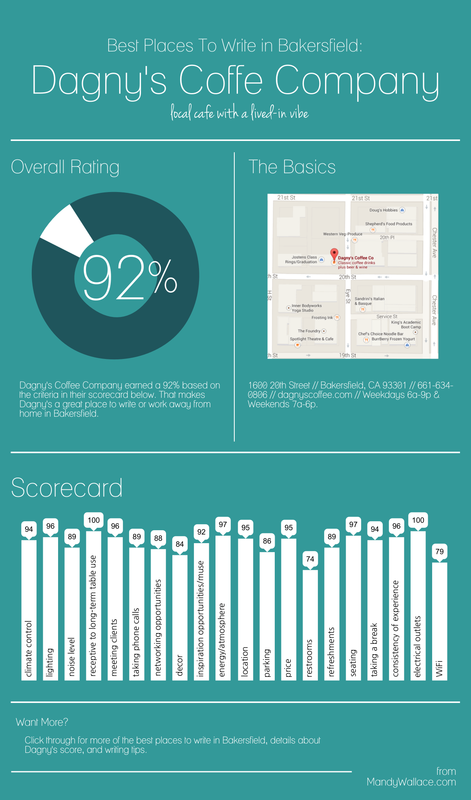 Details: 1600 20th Street // Bakersfield, CA 93301 // 661-634-0806 // dagnyscoffee.com // Weekdays, 6a-9p & Weekends, 7a-6p. Click to see Dagny’s detailed scorecard.